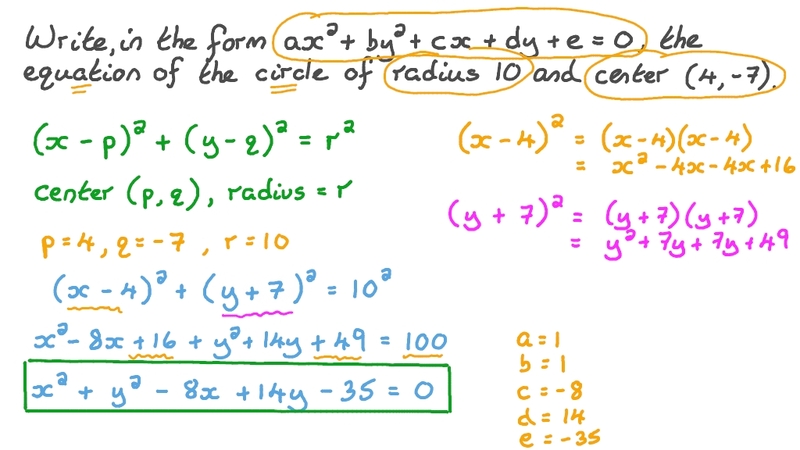 In this lesson, we will learn how to find the equation of a circle using its center and radius. Write, in the form 𝑎 𝑥 + 𝑏 𝑦 + 𝑐 𝑥 + 𝑑 𝑦 + 𝑒 = 0   , the equation of the circle of radius 10 and center ( 4 , − 7 ) . 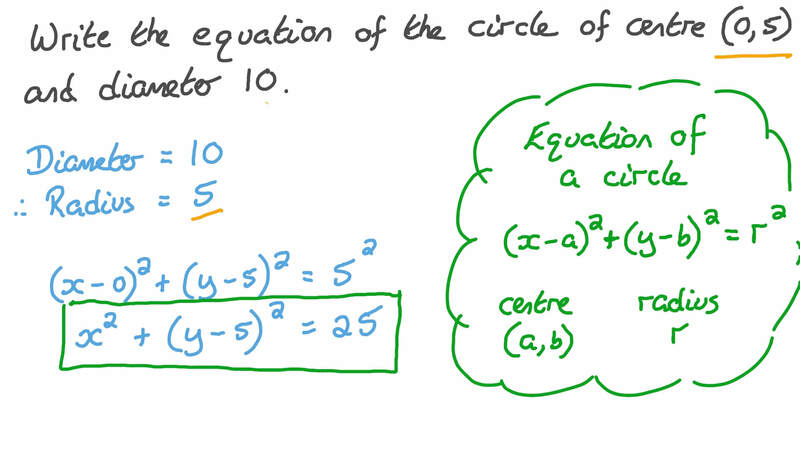 Write the equation of the circle of centre ( 0 , 5 ) and diameter 10. Give the general form of the equation of the circle centre ( 8 , − 2 ) and diameter 10. Find the general form of the equation of circle 𝑀 , given that it touches the two coordinate axes at 𝐴 and 𝐵 and that 𝑀 𝑂 = 6 √ 2 . 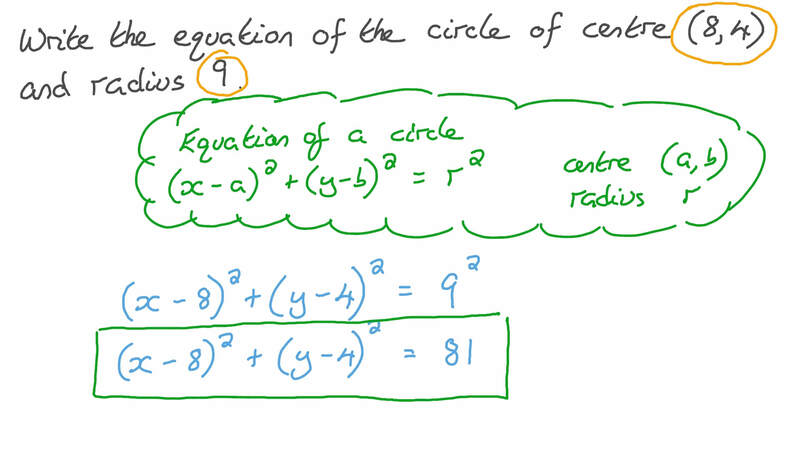 Write the equation of the circle of center ( 8 , 4 ) and radius 9. Determine the equation of a circle with radius = 1 7 c m , given that it touches the 𝑦 -axis at the point ( 0 , − 7 ) , and its centre lies in the third quadrant. What is the equation of the circle of radius 24 that lies in the third quadrant and is tangent to the two axes? Find the point of intersection between the line with equation 𝑦 = 1 2 5 𝑥 − 2 6 and the circle with center ( − 2 , 3 ) and radius 13. Let us consider a circle of radius 4 and center ( 2 , − 7 ) . Write the equation of the circle. The circle is dilated by a factor of 2. The center of dilation is the center of the circle. Write the equation of the circle. Let us consider a circle of radius 6 and center ( − 2 , − 5 ) . The circle is dilated by a factor of 1 3 . The center of dilation is the center of the circle. Write the equation of the circle. A circle is tangent to the 𝑥 -axis at ( 8 , 0 ) and cuts a chord of length 2 √ 3 7 7 on the negative 𝑦 -axis. What is the equation of the circle? A circle of radius 39 length units has its centre 𝑀 at the point ( − 1 1 , − 1 5 ) . Given that the circle intersects the 𝑥 -axis at points 𝐴 and 𝐵 , determine the area of △ 𝑀 𝐴 𝐵 . In the figure below, find the equation of the circle. Given 𝐴 ( 1 0 , 9 ) and 𝐵 ( 1 0 , − 1 ) , find the equation of the circle with diameter 𝐴 𝐵 . Write, in the form 𝑎 𝑥 + 𝑏 𝑦 + 𝑐 𝑥 + 𝑑 𝑦 + 𝑒 = 0   , the equation of the circle of radius 10 and center ( − 7 , − 8 ) . Write, in the form 𝑎 𝑥 + 𝑏 𝑦 + 𝑐 𝑥 + 𝑑 𝑦 + 𝑒 = 0   , the equation of the circle of radius 4 and center ( − 6 , 3 ) .